The ouija (/ˈwiːdʒə/ wee-jə, sometimes /ˈwiːdʒi/ wee-jee), also known as a spirit board or talking board, is a flat board marked with the letters of the alphabet, the numbers 0-9, the words "yes", "no", "hello" (occasionally), and "goodbye", along with various symbols and graphics. It uses a planchette (small heart-shaped piece of wood or plastic) as a movable indicator to indicate a spirit's message by spelling it out on the board during a séance. Participants place their fingers on the planchette, and it is moved about the board to spell out words. "Ouija" is a trademark of Hasbro, Inc., but is often used generically to refer to any talking board. Spiritualists believed that the dead were able to contact the living and reportedly used a talking board very similar to a modern Ouija board at their camps in Ohio in 1886 to ostensibly enable faster communication with spirits. Following its commercial introduction by businessman Elijah Bond on July 1, 1890, the Ouija board was regarded as an innocent parlor game unrelated to the occult until American Spiritualist Pearl Curran popularized its use as a divining tool during World War I. Paranormal and supernatural beliefs associated with Ouija have been harshly criticized by the scientific community, since they are characterized as pseudoscience. The action of the board can be parsimoniously explained by unconscious movements of those controlling the pointer, a psychophysiological phenomenon known as the ideomotor effect. Some Christian denominations have "warned against using Ouija boards", holding that they can lead to demonic possession. Occultists, on the other hand, are divided on the issue, with some saying that it can be a positive transformation; others reiterate the warnings of many Christians and caution "inexperienced users" against it. This Ouija Spirit Medium Skull Statue is 6.25" tall 8.5" Long and 5.75" Wide approximately. This figurine is not made by actual paranormals and has no spiritual powers. 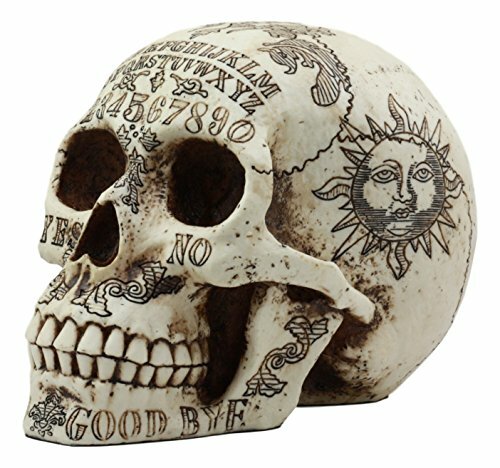 It is being sold as a decorative skull.